Lisa Papineau was good friends with my then-girlfriend Anne Kadrovich. In 1999, Lisa and bass legend Juan Alderete asked me to do some recording with them for their new project, after being left high and dry by a previous partner. Lisa was well-known in the music scene at the time, and had sung with several other bands I knew and on several records. I mostly knew her through Pet, the band she was in with Tyler Bates. Pet was the first band on Tori Amos' label, but was in a bit of a tough stretch when I encountered them. Juan was also well-known, though I had also most recently seen him playing bass live with Pet. I leapt at the opportunity. I had already learned the most important part of making good records was to start with good musicians, and Lisa and Juan were the best of the best. They showed up at the garage, Juan with his bass, and Lisa with a Casio keyboard, which provided the basic sounds and drums. We tracked the drums straight out of the Casio. I had suggested using other sounds or loops, or beefing up the Casio sounds, but Lisa and Juan would have none of it. That's the sound they wanted. Nothing else. Lisa also brought a special borrowed microphone that probably cost more than my car. It came in a little suitcase. It was worth it, for her beautiful, magical voice. Juan plugged his bass into a DI and went more or less straight to tape. After the basic tracks, I had all kinds of ideas for how to enhance or improve them, generally involving synthesizers, weird effects, drum replacement, too much reverb, or all of the above. The band was reluctant to adopt most of my suggestions, and I was too young and green to handle it well. Wasn't I supposed to, you know, DO something to make it sound good? I added what I could, and wished I could add more. I was worried they wouldn't like the results, because as great as they were, the plain Casio backing just didn't seem to work well enough. Distinctive? Maybe. But not great. I briefly rehearsed with them a bit for their live band, too. But my temperament (and perhaps creativity) was a poor fit at the time, and we parted ways in a rather contentious fashion (pretty much all my fault, and we set things straight later...but I still feel like I fucked up real good). Big Sir ended up finishing the record with L.A. fixture Mickey Petralia. This was a smart move, because Mickey had credibility, connections, and a similar vibe. The album was released to great critical acclaim. This time, I was well-credited...even if I was a little miffed that much of Mickey's work seemed to be the exact same things I had wanted to do. As for me, I went on to join Widget with the other two members of Lisa's old band PET, Tyler Bates and Alex Locascio. I remain proud to have been a part of Big Sir. It was a treat to work with such great artists. Big Sir has continued to make records, even as Lisa and Juan have pursued their own projects. This is my rough mix of a track that made the first record. I prefer my mix to the released version, but as it is a rough, it is flawed, and unfortunately diminishes the band's character in favor of my production aesthetic and studio limitations of that era. 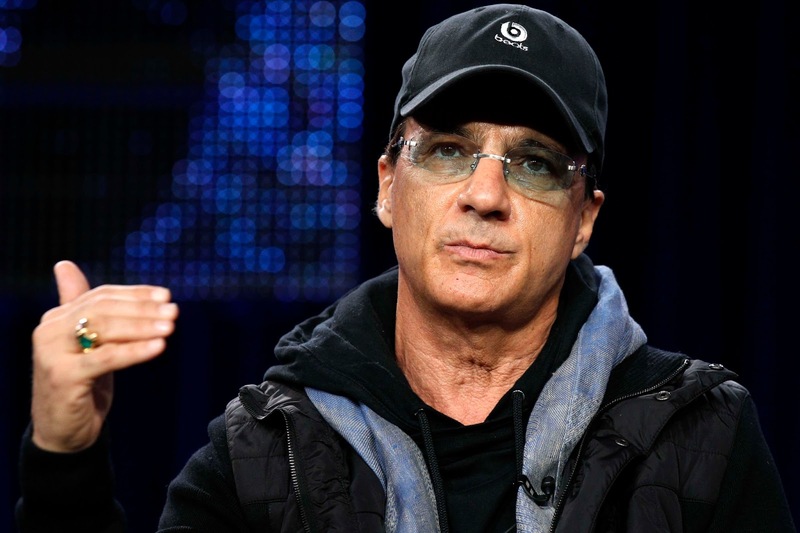 The digital music business controversy of the moment is centered around free trials. Specifically, some people are expressing outrage over Apple Music's desire to not pay artists (or any content owners) for the 90-day free trials users receive. That is to say while users may get to play all the music they wish during the first 90 days, Apple doesn't have to pay the artists or composers or labels or publishers anything. Then again, Apple doesn't make any money either. Some artists and composers think this is unfair. This "don't pay for free trials" has been standard practice in the digital music business for nearly the entire time it's been operational. There may be controversy here, but this is not a new or unique practice, and Apple's not the only one who's doing this. Every subscription service is doing it, and most have been doing it for years. This issue is getting blown way out of proportion, largely because Apple is somehow involved. I am disappointed but no longer surprised that neither the traditional press nor the digital music/media "press" knew about or included these points in their stories. My more cynical side thinks this current outrage is a ploy to change these industry-wide deal terms by publicly embarrassing Apple and getting a critical mass of consumers to say "yeah, hey, that doesn't seem fair!" This is unlikely to succeed. More importantly, the folks agitating for Apple and others to pay during these free trials are misguided, unless their objective is to make all the subscription services fail and shut down. (Which it may be, and that is also unwise, but that is a post for another day). Getting people to sign up and understand subscription services has proven difficult since the industry's inception. The industry has tried a few things: unlimited free :30 clips, limited numbers of complete plays monthly (i.e. free 25 plays per month), guaranteed satisfaction or your money back, and so on. When they tried :30 clips, users were confused. Who would pay for :30 clips? So they tried limited numbers of complete plays, and users were so worried about using their plays they failed to play anything, and didn't use the services. Users were reluctant to start a billing process knowing how difficult and tricky it could be to get un-billed. Giving away the service for free is pretty lazy, but it seemed to work better than the other options. Even the beloved Netflix has a 1-month free trial. Curtailing the free trial would almost certainly cause subscriber acquisition to plummet for all services. Yes, it is true that with free trials, you do get a ton of "freeloaders" who have no intention of subscribing, and who try to bounce from one free month to another. But you also get users who want to understand the size of the catalog, or hear the sound quality, or test the user interface out. Free trials are better than nothing. And given the extremely high costs of content the artists, composers, labels, and publishers charge, it is the only way to make customer acquisition work. Some quick math: Typically services have to pay $8 to the content owners every month, taking it out of a $10 total fee. If the services had to pay for the first free month, it would take them 4 months of billing just to recoup that $8 of customer acquisition cost. That's not realistic for several reasons. One is that most subscribers don't stay that long (citing the high cost -- the $10 price -- as a key reason for leaving!). Another is that acquisition costs don't consist of just the $8 for a single month of free use. They include advertising, promotion, marketing, and all the other things that go to getting that message in front of customers. It is also conceptually similar to the practice of "free goods", whereby ye olde record companies would allocate some percentage of the albums shipped to record stores as "free", either to cover against damage in transit (yeah, right) or for the generic "promotion". Everybody in the industry knew the stores sold all of these copies and pocketed the additional revenue (while the artist got nothing). As per usual, the digital world is still better -- you have perfect accounting, ways to adjust the amount of free plays, and no cut-out bins (and associated shady practices). The digital music business and the various players, past and present (including Rhapsody, Spotify, etc.) are not without fault here, either, however. There's been scant innovation in the customer acquisition department. The on-boarding and first-run experience for these complex services remains poor, with brand-new users lucky to get a sub-smartphone welcome screen explaining what to do and why. The services generally understand some users will have a kind of epiphany, see the value of the service, and stay subscribed almost indefinitely...but they have very poor understanding of what causes that for users, and how to accelerate that process or make it happen at all. The current mindset is basically "hope the user gets it". The most effective way of acquiring users has been hoping your existing users will (continue to) evangelize on your behalf, and explain everything to new users. My research and experience has shown very little correlation with the length of the free trial and the likelihood of user conversion. If anything, there's a trial length which negatively correlates with user conversion: make the trial too long and the user loses all urgency to sign up and pay, and in fact finds themselves saying "I hardly used the service at all over the last several months, I guess I don't need to pay for it". Longer trials don't help. The problem with trials isn't the length, it's the total inattention paid to the user experience during that time. It's as if you walked into a car dealership thinking about buying a car, and they threw a keyring at you, said "bring it back in a month", and turned back to their keyboards and paperwork. And really, if your experience isn't captivating users within the first hour, if not the first 5 minutes, you're probably doing something wrong. 90 days is forever. Even 30 days is a lot. And this is for a product that costs a mere $10 per month, or $100 per year. If products with much more at stake don't offer those types of terms, why should music have to? This is something Apple normally understands quite well: their products generally "demo" extremely well, inducing instant want and desire in customers. Apple's insistence on long free trials -- the same thing everyone else has been doing for years, and which obviously produces only mediocre results -- is indicative of the lack of innovation they are bringing to market here. I would humbly suggest that rather than asking for 90 days free, the industry collectively work on making the first 5 minutes or hour or even day excellent, compelling, and worth paying for. If one day isn't enough to convince me, do you really think 89 more will help? If there was any justice in this world, E*lux (Electrolux, before Big Vaccuum came down on them) would have been signed and huge. I met Kevin Bombay and Bobby D. somewhere, during the late 90s. Probably at a show our friends were playing (Tuscaurora? DKO?). Their band E*lux also featured Tony Babylon (a long-time L.A. fixture, known for procuring rare instruments for people) and Mark Poland, whose brother Chris Poland was one of Megadeth's guitar players. I thought they were amazing. A perfect combination of elements from The Cure and The Cult. Goth and Glam. Great songs, great players, great voice. Edgy guitar tones combining the best of new wave and hard rock. Bobby's powerful, soaring voice was the result of studying singing with a cantor, and combined with Kevin's guitar playing, I thought they really had something. They also put on a great rock show. In 1998, I heard a cassette of their demo, and I didn't feel like it captured their power. After talking with the band, we did one track at my place with just Bobby and Kevin, which I overly-synthed and under-ly guitared, but they still liked it! I contributed some arrangement ideas and helped shape the song. Based on that success, they decided to record several more songs. Again, I made some arrangement suggestions, helped make the songs a little tighter and more hooky, and did my best to make them comfortable and sound good. "Lonely" was the first song we finished with the full band. I cheated quite a bit, with having the perpetually shirtless Mark play an electronic drum kit to trigger acoustic drum samples, and guitar and bass going through the then-brand-new Line 6 Pod instead of micing amps. Given how quickly and inexpensively it was done (I think I charged them $300 total for 4 or 5 songs), it's still pretty rad. Big. Huge. Not bad for 1998. A perfect example of the most important part of making a good record: start with a really talented, great-sounding band who know how to play. E*lux combined the tracks I did with a remastered and better-sounding version of their original demos for their album "Pretty Accident". I loved seeing E*lux play. I have fond memories of watching them rock out at The Opium Den, Goldfinger's, and almost every other club of note at the time. They'd often play with Gwen Mars, another band I really liked (and who got signed to Hollywood records). So why didn't E*lux get signed? Why aren't they huge? Well, there isn't any justice in the world, and certainly not in the music business. As awful as it sounds, even in the late 90s, in Los Angeles, the A&R guys told them "you're too brown". E*lux broke up not long after I left L.A.
E*lux reunited for a few shows in the late aughts. Kevin Bombay plays in several L.A. bands, and taunts me with photos of his latest gear on Facebook. Tony Babylon is still dealing in rare, hard-to-find instruments. Bobby D. is also still playing music now and then. 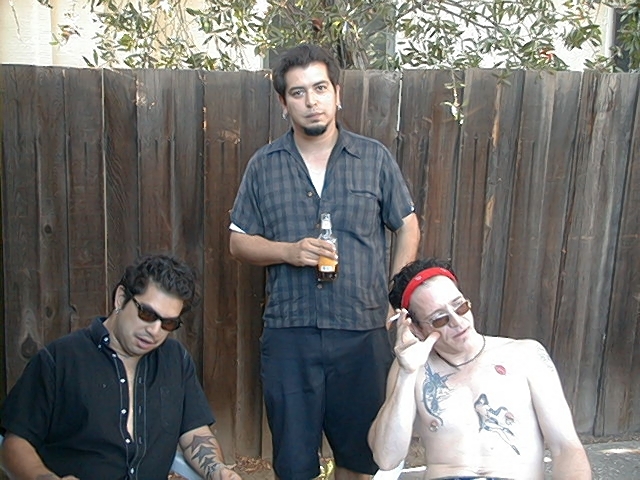 Bobby D., Tony Babylon, and Mark Poland, taking a break in my backyard during the recording sessions. Almost 15 years ago to the day, I left Los Angeles and moved to San Francisco. I was also leaving behind music in a professional capacity (or so I thought). In addition to the quindecennial date, I recently found out that a friend of mine from my L.A. days recently passed away. Thinking about her got me thinking about my time there, listening to old music, and reaching out to old friends. Over the next few weeks, I will be posting about some of the work I did in those days, and some of the people I knew. It's appropriate to begin with Joy Ray. A woman with striking looks, and intelligence and acerbic wit to match. Not to mention a wonderful name! 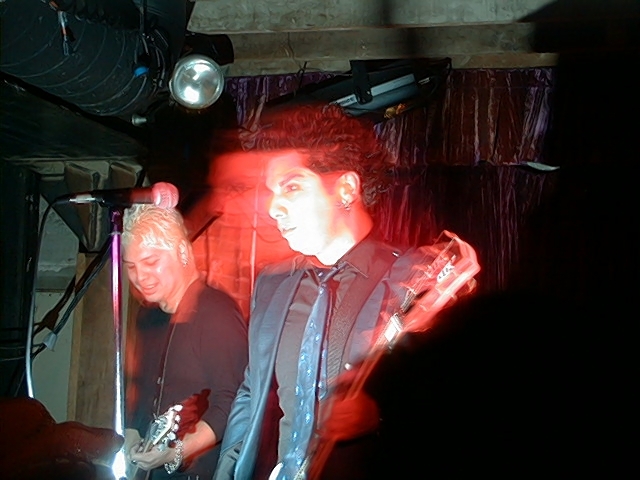 In the mid/late 90s, Joy Ray was playing in at least 2 bands in Los Angeles: Silverlake scene favorites SISSY BAR and the darker, more gothy SEVENSOFT. I can't recall exactly how I met her. Perhaps through my brother, whose band Don Knotts Overdrive was also part of the Silverlake scene, or perhaps through my friend Stan Fairbank, or maybe through Anne Kadrovich. I had seen Joy's bands play several times, and had seen her out and about at various parties. Joy approached me in late 1997 about helping her record some solo stuff. I had a pretty decent little studio set up in the garage of the house I was renting: 24-channel/8-bus Mackie mixer, DA-88 digital 8 track, about 3 racks of outboard gear (largely borrowed from Chris Fudurich and Ken Kessie), and a nice collection of synthesizers (also mostly borrowed from Chris), including a Jupiter-6, a Chroma Polaris, a Nord Lead 2, an Poly-800 (with "Moogslayer" mod), a CZ-101, a Moog Rogue, and a Fender Mark I Stage Piano. Plus a computer running Cubase. "Firefly" was the first song Joy brought in. She played it for me on acoustic guitar, and I immediately started thinking about what we could do. I had her record some basic tracks (typically a couple of passes of acoustic guitar and vocals) and started monkeying around with it. I can't remember exactly when we recorded it, but the initial tracking must have been around January of 1998, because I do remember spending all of the MLK holiday working in the studio on the song. In fact, working on "Firefly" was what convinced me to quit my day job and "do music full-time". After nearly a full day of pushing buttons and adjusting levels and making something that sounded like a "real record". We did a couple other songs, one of which, "Getaway", I actually didn't add much to...but I mixed it as weird as I could, with her vocal coming out of one speaker, washed in reverb, and run through some effects as though it were on a radio or telephone. Of the 4 tracks Joy and I worked on in late 1997 and early 1998, this was my favorite. I even brought in a real violinist (unfortunately I can no longer remember her name), who did a beautiful job of adding exactly what was needed, and took direction well ("how about some pizzicato?"). She played by ear, which was good, because I'd been so used to rock people playing by ear I didn't even think to write up a chart. I'd also never mic'ed a violin before. When she pulled out her violin and asked me "OK, where should I stand?" I was immediately thinking "Oh man, I totally don't know!" but she was a total pro, and added some violin to one of the other songs as well. Joy provided her dark lyrics, melodic sense, and a guitar part. I tried to turn the song into a tiny movie, chopping up some of the noise from the crickets infesting the walls to create a rhythm track, and adding some Eno-ish ambient synths, and a drum loop I may have cribbed from a Photek record (who I am pretty sure cribbed it from somewhere else). Joy brought in one of her friends to sing background vocals. They're in there, just real quiet. As this was one of my first projects as a producer, engineer, and collaborator this way, I made a lot of mistakes. I failed to build a good rapport with her, and we ended up disagreeing quite a bit about the direction of the record. I didn't pay enough attention to what she really wanted, and didn't have good skills for communicating what I thought would work best for her. I'm still pretty happy with these tracks, all things considered, but at the time, I recall that Joy definitely was not. I wanted to add more production and technology (probably too much), and make a kind of "space folk" record, and she didn't. After taking 4 songs to completion (including doing one over almost completely from scratch), we parted ways. There's still some nice sonic detail in there, though. I can still remember working on the song all through MLK day and realizing "man, THIS is what I should be doing with my life, not sitting in an office." And I quit my job a few weeks later to embark on "doing music full-time". Thanks for that inspiration, indulgence, and opportunity, Joy! Joy Ray married Jay Harsin, the singer for another band in LA (Chaser, whose song "That Ain't Love" remains in rotation at my house). They live in Hawaii and own and operate the Hearts and Stars Salon. My Dave Smith Instruments Prophet 12 arrived a while back. I haven't yet made an album with it, but have used it enough to have some opinions and thoughts. This is the new DSI flagship. It says "this is the best of our experience and knowledge". They have taken everything they've learned from their previous synthesizers, incorporated user feedback, and improved it all. It is easily the "best" synth they have made, and arguably the best polyphonic synthesizer available today, especially if you are someone who plays synth with your hands (as opposed to all-MIDI/computer sequencing). It offers an incredible amount of live surface control, and several features aimed at "live performance". This is one of the best-built synthesizers I have touched. The knobs are solid (and appear to be the same quality as other DSI gear) and reference the legendary Prophet-5. The buttons are firm and satisfying. The wood is nicely finished. The synth looks great, too. The LEDs aren't as blindingly bright as the Evolver. It is less "flashy" in every sense than many other DSI synths. I suppose some people may find that a drawback. I like the more understated approach. And they did include a bit of flair with the large lighted "12" in the upper right corner. The front panel is all silk-screened paint-on-metal, with no plastic overlay, save a small lip around the OLED screen. The plastic overlays were never popular with the synth community, which at the moment has become oddly resistant to change. The layout and typography are also clear and attractive. And they spelled "filter" correctly this time. Prophet-12 has an integrated power supply with a standard IEC cable - no wall wart. The keybed feels different than the Poly Evolver - stiffer, and the keys are flatter. This may just be a function of the age of my Poly Evolver Keyboard - maybe it was stiffer when I first got it years ago. I'm not a particularly skilled piano player, and key feel isn't something I have much opinion about. Pitch and mod wheels have grippy rubber around the outside edge. They may not look as amazing as the all-clear Poly Evolver Keyboard wheels, but they are much easier to use. Prophet-12 also has the same kind of position and pressure sliders the Tempest has. These are fun, and I find them far more useful for performance than the standard pitch and mod wheels on most keyboards, as you can tap, slide, and/or press with precision and speed in a way that wheels don't often offer. Using the extensive modulation matrix, it is easy to assign multiple parameters to these. The OLED screen is bright and legible without being overpowering, though like all OLED screens, it does weird things in my eyes when I look away suddenly. DSI's interface design is logical and clean. The synth interaction is clear, easy to use and learn, deep, and most importantly, fast. The bottom "half" of the control panel shows signal flow, from oscillators to "character" to filters to VCA to feedback to delay. The upper "half" has effects, arpeggiator, and modulation (LFOs, slots, envelopes). Every synth parameter has a dedicated knob on the front panel. Once you turn a knob, the relevant "section" appears in the screen. This allows you to see what you're adjusting quickly. The soft knobs over the screen are also detented, so if you're having a problem getting the exact value you want with a smooth knob, you can turn a soft knob to click to the exact value. A brilliant idea. You've just assigned a modulation routing! It is incredibly intuitive and again, fast. DSI goes further by automatically assigning the first free modulation path. And you can sort the modulation path list. Improving on Evolver, DSI offers 16 fully-configurable modulation paths plus the 8 "fixed" paths (hard-wired to the 4 LFOs and 4 envelopes). This is particularly exciting, because these make the synth semi-modular. These paths were my favorite programming feature of Evolver, and I constantly wished I had more. Now I have plenty. You can also manage all of this with soft knobs in the menu. The oscillators are all-new, and all-DSP-based. There's already a ton of internet griping about this, but the Curtis chip-based DCOs of the previous DSI line had some intractable problems. Going digital solves these problems, and opens up a wider range of sonic possibilities. The new digital oscillators have 3 modes - An "analog modeling" mode (Sawtooth, Pulse, Triangle, or Sine), a "wave shape" mode, and 3 types of noise. (the synth doesn't actually consider these specific modes, but different features are available depending on which wave you select, and it's convenient to think of them this way). Analog modeling produces great-sounding basic shapes. These appear to be actual DSP models, and not merely single-cycle waves. The "Slop" parameter adds some very nice liveliness to the sound at low settings, and goes all the way up to totally broken "this is why we abandoned analog" territory. The "shape" parameter allows for various deformations of the wave shapes. For example, deforming the Square shape yields pulse width modulation. Aside from the classic analog shapes, you can choose from a variety of wave shapes. Some of the sources and character are obvious ("Tines", "Ahhh", etc.) and some less so. All are harmonically rich and interesting. When these kinds of wave shapes are chosen, you have the ability to pick 3 different shapes - a "Left", a "Center", and a "Right". You can then modulate across the 3, and sound will smoothly transition and morph. For example, you could pick 3 different shapes for the oscillator, then assign an LFO to that oscillator's "shape" mod parameter. This will sweep through the various shapes, back and forth. Or you could use an envelope to get motion through them. Or velocity. Or key number. Or mod wheel. Or whatever. It's conceptually similar to the wavetables of the PPG. On the plus side, you're not limited to PPG's wavetables. You can effectively build your own, by picking a left, center, and right. On the minus side, these aren't as big (in size/length) or diverse (in selection) as PPG's wavetables. Ultimately, this architecture allows creation of the kind of evolving digital tones the Prophet-VS was known for. There are 3 noise types available as well. Plus a sine sub-oscillator. And all of that is for just one oscillator. You get four oscillators per voice. Go back and read all that again. Let it sink in. You can have 4 different wavetables per voice, each modulated differently. Looking at what you can do with the oscillators together, Prophet 12 continues to shine. It's got analog-style exponential Frequency Modulation (FM). You can't do DX7-style linear FM on it, but you can get some very cool effects. FM on the Prophet-12 has a deceptively simple architecture, where the oscillators are connected in a loop: O4 is modulator for carrier O3, which is also modulator for carrier O2, which is also modulator for carrier O1, which is also modulator for carrier O4. You can use the basic sine wave shape for all the oscillators for simple tones. But you can also use any of the other shapes available as carriers or modulators. And that also means that any of the modulation parameters you use for shaping oscillators can apply to carriers or modulators. And since they're connected in a loop, you can get "feedback". And unlike the DX synths, you also get the analog lowpass filter, the highpass filter, the delay, the feedback, etc. There's also amplitude modulation using the same methodology. And you can use both FM and AM at the same time. Hard sync, too, which works in the same O4 → O3 → O2 → O1 fashion. So you can hard-sync more than one oscillator, or 2 discrete pairs. The net result is a very flexible synth, that can easily produce some beautiful/crazy digital-but-alive sounds in addition to the analog basics that are so much in vogue these days. If all of that doesn't have you excited enough, there's a few other unique qualities to this synth. It has a resonant high pass filter. You don't see that very often in synthesizers. It has a tuned feedback loop (like Evolver), and yes, you can do Karplus-Strong synthesis. The "Character" section is also unique. DSI offers decimation (sample-rate reduction) and bit depth reduction ("Hack") to make the synth sound more digital and lo-fi. Turning these up a bit is a quick path to recreating PPG-style grit. There's a soft saturation "Drive" parameter. "Girth" and "Air" are smart EQ - bass and treble, respectively. Of course, you can modulate all of that. 4 LFOs, which can be set to sync to MIDI tempo, have slewable shapes, and can reset with keypress and have user-controlled phase start! 4-tap digital delay, which has modulatable panning (aside from the obvious delay fun, you can construct flangers, choruses, and even reverb with this). A software update added a resonant lowpass filter, independent for each delay tap. Incredible. You have 12 voices to play with per patch. You can choose to set it all to Unison, with as little or as much detune as you want. You can set up 2 patches per program, either stacked or split (each patch gets 6 voices). And you get storage for 396 user programs on top of the 396 "factory" programs (which are read-only). You can even build a "playlist" of the programs you like, in order, for gigs. This is largely subjective. Most people don't care for their synth presets. But I have only walked through the 396 Factory sounds a couple of times, and there are few I found immediately inspiring or useful. That said, there are a few really great ones in there, and some that did make me sit up and start playing. But given the preset's unwritable/unchangeable nature, I would have expected a few more basic, usable sounds somewhere, and perhaps some better organization (the Alesis Ion is still my gold standard for this, with 4 banks filled with usable sounds, and the banks consistently organized so the first 10 sounds are always basses, the next 10 leads, then 10 pads, and so forth). I also would have expected a more standardized and comprehensive set of modulation routings. Many of the sounds do not take advantage of all of the available controllers (particularly slider pressure and aftertouch), and they don't typically use the controllers the same way when they do use them. 396 user sounds is plenty for me, but it's hard not to look at the 396 factory sounds and wish there were more I liked, especially given the considerable talent and effort that went into the batch provided. $3,000 street price. But it is difficult to think of another synthesizer offering this particular feature set at any price. The Nord Lead 4 is similar in price, knobs, and polyphony, but it is all digital, no analog filters or distortion, and has a far more limited architecture. There's the Waldorf Blofeld keyboard, which is perhaps a third the price of the Prophet 12, but it is also 100% digital and requires quite a bit of menu-diving or a PC editor to program it. Moog Voyager is the only thing that remotely approaches Prophet 12's quality or cachet, but you get only one voice. I suppose there's the John Bowen Solaris, which is even more expensive and 100% digital, but supposedly is quite nice (I haven't used one, so I can't say). It's also available in very limited quantities, and you can get a Prophet-12 right now. This is a pro as much as a con, but this synth will require some work to get the best out of it. I'd say it's much easier than Evolver, due to some workflow improvements and the great oscillators, but I expect some users will have a hard time at first. Software synths are wonderful, but I consider most of them to be disposable. I find programming with a mouse to be tedious, and the PC, operating system, and software updates required to use them make them far less expensive and useful than you might think. A good hardware synth will last you decades. The Prophet-12 sounds great, works great, looks great. You can use it to create the same sounds any other analog or digital 2- or 3-oscillator synth can create. You'll be happy. Or you can create vast new sonic landscapes, the likes of which have never been heard. I'm off to explore right now.